Fort Myers, FL – March 18, 2019 – Billy Rollins, CCIM, ALC, with LSI Companies, Inc. from Fort Myers, FL, has been recognized as an APEX 2018 Top 20 National Producer by the Realtors® Land Institute as a part of the RLI APEX Production Awards Program, sponsored by The Land Report. This marks the second consecutive year Rollins has been recognized for this prestigious award. The awards ceremony took place on Tuesday, March 5, during RLI’s 2019 National Land Conference (NLC19) in Albuquerque, NM and was presented by RLI CEO Aubrie Kobernus, MBA, RCE, as well as The Land Report’s Co-founders Eddie Lee Rider Jr. and Eric O’Keefe. “I am honored to be recognized by RLI for this award,” said Rollins. “I have an exceptional team behind me at LSI Companies and I would like to thank them for the goals I was able to achieve.” Rollins has been a part of RLI since 2007 and is currently the President of the Florida Chapter. “We are proud of Billy and all of our members that were recognized as part of our award programs for their accomplishments in 2018. They truly are the crème of the crop when it comes to land real estate professionals,” said Aubrie about the winners. The APEX Awards Program celebrated its second year by doubling in size with 100 applicants totaling a combined $2.3+ billion in qualifying transaction volume. All land professionals recognized as part of the RLI APEX Awards Program are active members of RLI. The 2018 APEX Top 20 Award winners were ranked within the top 20 applicants by qualifying production volume, starting at around $36.5M in production volume. For more information on the award winners, make sure to get a copy of The Land Report, one of the industry’s leading magazines for landowners and land professionals, which will be publicizing the top winners in their upcoming Spring 2019 issue. 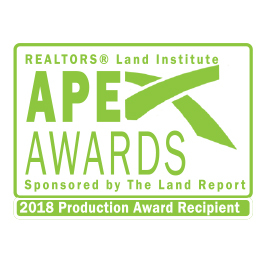 All land real estate professionals are invited to join RLI and apply to the prestigious APEX Awards Program next year. Learn more at www.rliland.com.